So how about a competition based on one of my designs? The Prize can be...oh how about five of my charts of choice (and the range is growing by the week!). No, that is a bit mean! How about Ten pdf charts OR a gift voucher for the value of the ten charts for you to use at your leisure? Here is a picture of my Valentine's Butterfly. It is designed in monochrome (black) BUT what I want you to do is make it your own. Choose your colours, fabrics, decide if you want to fill in the blank spaces and have fun! Design size is 100 x 90 stitches. You can use beads, ribbons, whatever you want. Allow your imagination to go wild! Post your name so I know you are entering and pm me with your email address and I will send you a working chart and in return you can send me a picture of your finish. I will put them all up on here and on the facebook page and on March 1st, people can vote on their favourite! Closing date therefore is March the 1st which gives you plenty of time to play. I want this to be a real celebration of your creativity so it would be wonderful if you could share details of the competition on your blogs...as I am unable to do much stitching myself at the moment I am so needing to 'feel the stitchyness'! Email me at stitchersanon@outlook.com and I will send you the chart! Please can you send me the chart when you get the chance . It will be lovely for a Love Quilts square , and perfect size. Can't wait ! Hope you manage to get the pain sorted out soon. I'm wondering if a TENS machine might help ? Gaynor, I'd love to stitch your butterfly. I've got a lot of miscellaneous threads from HDF that would be fun to use to stitch this with. The most challenging part will be the actual finishing of it as I'm not that handy with that yet. I really hope the shingles calms down soon for you. I've not yet experienced it myself, but I know others who have and had it last for longer than they care to remember. Would like to give it a go - hope the back improves soon. i hope that you are feeling much better very soon with your back. I do like your butterfly and I want to stitch it. I love your daughter's reaction to the "tweaking" and can see Little Brother having the exact same one…so gullible these silly kids! Take it easy and know that you are in my thoughts…and a wee pkg may be heading your way just for fun. I know a few who had the shingles over he holidays and are struggling since the weather turned a bit colder with pains and spasms, I hope yours are soon gone for good and you can get back to normal again. hahahaa love the twerking joke ... I know how you feel exactly as that is what happens to mine too frequently ....can you use a tens machine ??? Not even going near that 'twerking' again... But I would love to give your celtic butterfly a try! Thinking about it already!! So, will you always have shingles complications? Forever? I barely listen to the commercials on tv. I did not have chicken pox as a child and they gave me a shot for them when I was pregnant the last time, so... maybe I have less chances of getting them. Don't know. Rest here and there. Hugs to you! I would love to stitch your butterfly! I am glad you do not have a back injury-though the shingles are just as bad. 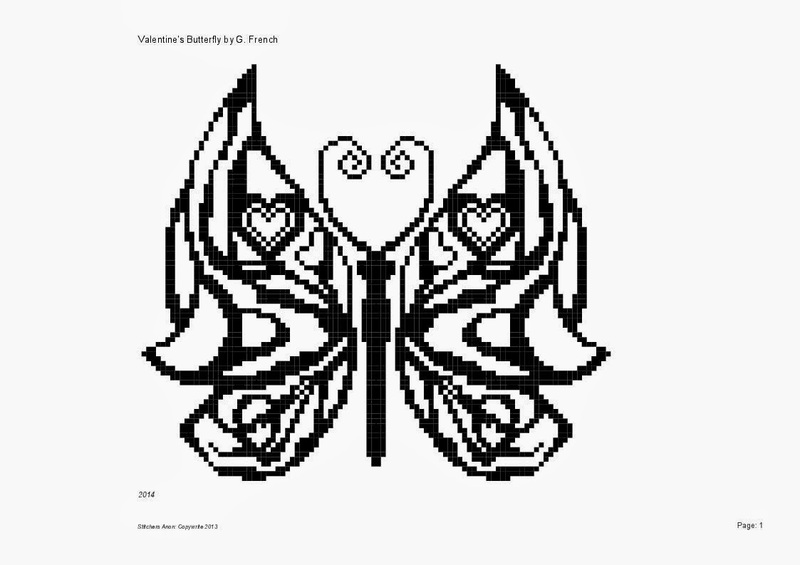 I'd love to stitch your Valentine Butterfly! Thank you for the chance! I make an ornament tree for each holiday, so this will be perfect for that! I'm in!!!!! I'm really enjoying my butterfly! !